Quite nice old-style hotel, near harbour and not far away railway station. Nice surroundings! Easy to find and convenient for town. Breakfast was fine and staff were friendly. Room with single bed was exceptionally large with lots of closet space, desk, chair and good lighting. At first I thought curtains were a bit thin and would let light in, but no problem. It was fun to have a street view from the window and except for a bit of Saturday night noise early on, it was completely quiet and I slept well. Good breakfast choices. Another nice thing is that the hotel has a handy bar with a charming woman tending it. Also, there is a very reasonable and good restaurant with German and classic dishes to eat inside or out, or take-away. I enjoyed my spaghetti dish with a beer sitting out front. Location great for touring by foot and close enough to train station to walk with luggage. I particularly recommend the 'Wrack' Ship Museum. Lots of interesting & varied exhibits, many about animals. Hotel owner gave me good directions, as it was a bit hard to find with map. Spotlessly clean, I was so impressed, I felt inclined to check even over the doors, and not a speck of dirt. Was the first time I found a place that was actually as clean as my home when I prepare for company! We had a two bedroom apartment. Kitchen cutlery and plates perfectly clean. Living room had a wonderfully big TV. Lots to visit within walking distance. Off street parking right in the spacious lot. Dinner in their restaurant was very good. Lovely standard German breakfast. We all needed a comfortable, relaxing, calm place to stay and this location did so perfectly. Frühstück mit reichhaltigem Angebot. Alles parat zur freien Auswahl. Die zentrale Lage des Hotels ist hervorragend. Taxibestellung durch Hotel sehr gut, kurze Wartezeit. Bei zukünftigen Aufenthalten in Cuxhaven werde ich mich wohl wieder für dieses Hotel entscheiden. Das Personal ist sehr freundlich. Die Lage ist super. Das Hotel an sich ist zwar sehr alt - hat aber Charme. Handwerklich wurde viel "selbst" gemacht und ist deshalb nicht so 100% ig geworden. Es gab ein einfaches aber ausreichendes Frühstück. Das Treppenhaus wäre das einzige was demnächst mal gemacht werden sollte. Alles in allem waren wir sehr zufrieden. sehr freundlicher Empfang, super Lage, wenn man den Hafen mag, Frühstück normal, keine 'Specials' aber ok .
Zimmer modern eingerichtet und sehr gemütlich. Sehr groß. Super Hotelbett. Kostenloser Parkplatz. 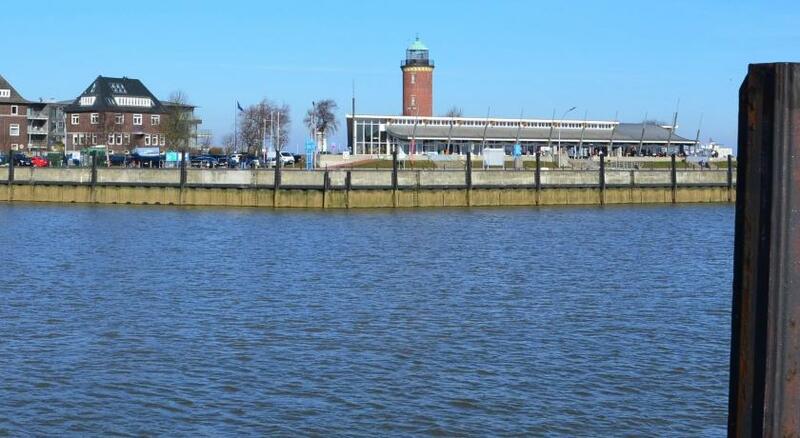 A 5-minute walk from the center of Cuxhaven and 150 feet from the Marina Cux museum ship, this hotel offers cozy rooms, varied cuisine, free parking and a private boat. Your day at the Hotel Hohenzollernhof begins with a generous breakfast buffet, which is included in the room rate and served from 06:30 until 09:30. Explore the city center on foot. Fish specialties and traditional German cuisine is served for lunch and dinner in the Restaurant Hohenzollernhof. Guests traveling with children will appreciate the hotel's family rooms as well as the special children's menus. When would you like to stay at Hotel Hohenzollernhof? Classically decorated room with a cable TV and complimentary toiletries in the private bathroom. House Rules Hotel Hohenzollernhof takes special requests – add in the next step! Hotel Hohenzollernhof accepts these cards and reserves the right to temporarily hold an amount prior to arrival. A check-in machine is available for all arrivals after 9 pm. I had a view of a the next door roof, however it was still quite light in the room. The Hotel seems very old and quite scruffy. Needs bringing upto date. No lift and our room was on the top floor, with about 45 plus stairs to climb. Not good for elderly people and no help with suitcases. Breakfast very basic. Not at all sure about the triangular pillow - this seems to be a Northern Germany, or at least Cuxhaven thing, as my other hotel at the seaside had it. I do not find them comfortable for sleeping, only for sitting up reading in bed.